Item number DS402 - Taurus - Image © Digital Sky LLC. 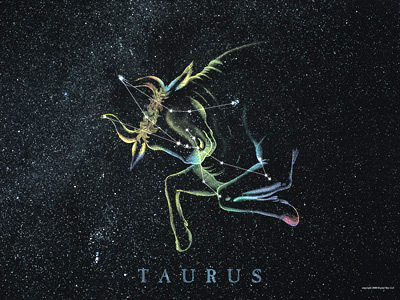 Taurus is a large and prominent constellation. The bright stars form an easily recognizeable V-shape marking the horns of The Bull. The brightest star in the constellation, alpha tauri or Aldebaran is usually seen as the Eye of the Bull.